We would like our Site visitors to feel confident about using the Site to plan and purchase their accommodations, so the Hotel is committed to protecting the information we collect. We only collect personally identifiable information on a voluntary basis. We do not require that you provide this information to gain access to our sites, and we do not require you to disclose more information than is reasonably needed to participate in an activity on our sites. We collect personally identifiable information such as reservations, inquiries, comment cards and registration primarily to e-mail updates and news, for entry into promotions and to notify subsequent winners, to send out brochures, etc. via regular mail to subscribers, and to respond to your questions or suggestions. We do not sell any information we gather at our web sites to anyone outside of our hotel, and it's affiliates. We do not transfer or disclose any information we gather at our web sites to anyone outside of Bayside Inn & Waterfront Suites, and it's affiliates, without your prior consent, except (1) in cases where we believe in good faith that we have a legal obligation to disclose such information, and (2) to certain suppliers that assist Bayside Inn & Waterfront Suites, and it's affiliates, in maintaining and managing the activities on its web sites. Please be assured that these suppliers are legally obligated to maintain the confidentiality of this information and do not acquire any rights to use your information for their own benefit. We may share non-identifiable aggregate information about our users (for example, the % of male and female visitors to our sites) with advertisers, business partners, sponsors, and other third parties in an effort to customize or enhance the content and advertising on our sites for our users. Our site is hosted in a secure environment. We employ appropriate security measures to protect the loss, misuse and alteration of the information under our control. When you enter personal information during the reservation process, your data is protected by Secure Socket Layer (SSL) software technology which encrpts information you input to ensure safe transmission. However, as no on-line data transmission can be guaranteed to be totally secure, we (like all web sites) cannot warrant or guarantee 100% security of any information you transmit to us at our web sites. Has a Go Daddy Secure Server ID. 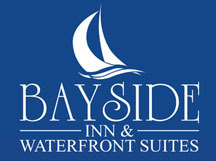 Neither Bayside Inn & Waterfront Suites, nor any of it's affiliates, shall have any responsibility of any nature whatsoever for other web sites linked to this web site, or any information contained thereon, none of which has been verified or endorsed by either Hotel Veritas or any of it's affiliates. © 2015 BAYSIDE INN & WATERFRONT SUITES. ALL RIGHTS RESERVED.